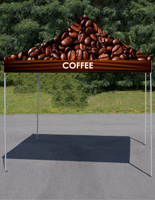 This custom printed pop up canopy occupies a 10x10 area at events. 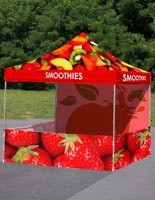 Printing for the promotional tent is a full color dye-sub process. 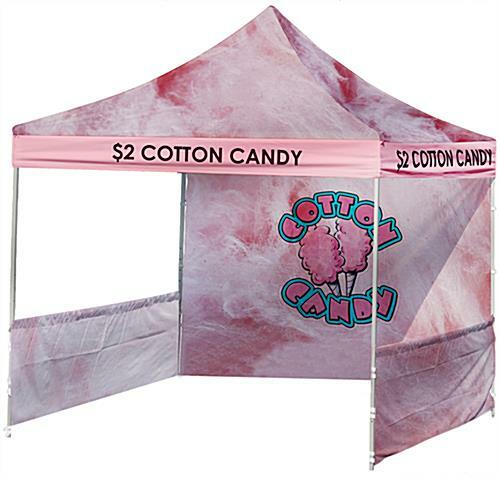 The printed pop up canopy allows logo artwork to be customized on the back wall, side walls, valances and top portion. 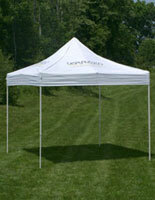 The 10x10 tent material is a water-resistant polyester fabric. 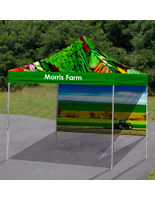 Each printed pop up canopy for commercial use has a collapsible design which allows for an easy assembly. 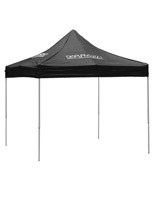 For portability, the promotional tent comes with a black carrying bag for the aluminum frame. The outdoor display will get your company noticed at your next event. 115.0" x 135.0" x 115.0"
An in-stock lead time of 23 business day(s) begins after the artwork proof has been approved. Product does NOT ship on a same day basis. 100% worth the price | 10 Stars! 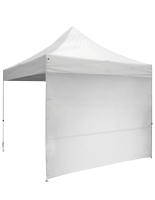 We purchased the 10 x 10 Outdoor Canopy Tent with the back wall and side walls, as well as a 6' stretch, fitted table cover. Normally, purchasing something like this through an online vendor is a risk, but Displays2Go produced at 10-star quality. 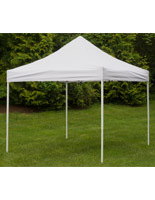 The tent is great quality and sturdy. 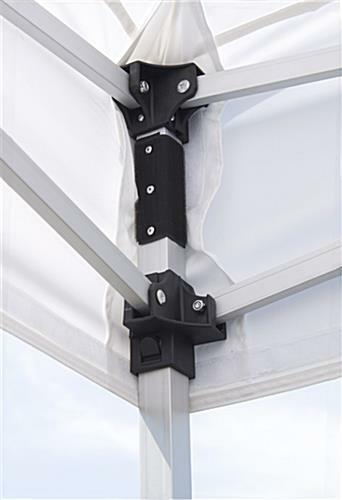 The top canopy is also just as sturdy with high-quality fabrics. The back and side walls are easy to put up and also produced with the same high-quality fabrics. 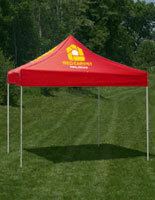 Overall, we are extremely pleased and will purchase all of our tents/table covers from Displays2Go in the future. Thank you! We were very impressed with the quality of our tent! It was an exciting day when we got it in the mail (right on time!). After unpacking everything, we were pleasantly surprised at the high quality fabric on the canopy, back wall, and side walls, and the frame. The colors were exactly what we wanted as well. In setting up the tent, the only issue was matching the instructional video online to the tent we had. Watching the video, we realized that the framing for the half side walls was different from what is shown in the video. However, after the 5 of us setting up the tent put our heads together, we were able to figure out the proper construction. Overall, we were very pleased and can't wait to use our tent for events throughout the year. Added bonus was that we were searching for the cheapest tent, and Displays2Go was our go. Thanks a lot! Hi Sarah, Thank you for the review and the photo. We are so happy you are pleased with the tent.